The One Ring, like the Ring of Gyges, had the ability to corrupt immoral beings, and only those with ‘purity of heart’ were able to overcome the allure of Sauron’s creation. To resist temptation and to flout the impunity of social condemnation is to be a just and moral man – or in this case hobbit. 2) Some exciting new lectures from the Mythgard Institute are detailed over at The Oddest Inkling. You can bet I’ll be signing up for all that I’m free to attend, but especially Malcolm Guite’s lecture on “The Truth of Imagination in the Writings of Lewis and Tolkien.” Mythgard offers online courses in medieval, mythical, and fantasy literature. 3) A beautiful post from the blog Corasteel on Neil Gaiman saying goodbye to Terry Prachett has brought up a lot of thoughts about writing, memory, time, mortality, and of course, the incomparable Prachett himself. 4) Forget “fact vs opinion” – Over at Blog, Blogger, Bloggest Steve Morris tells us all about the rich and nuanced world of truth claims. 5) I have some mixed feelings about filling out March Madness brackets along-side student athlete progress reports this semester, especially after reading articles like this one. But then I read this, and I felt a bit better. I also now have a favorite football player, which is new for me. In mid-1940’s, when the modernist movement in poetry was at its height, McAuley and Stewart hatched a plan to expose modernist poetry for the tripe it is. Using random lines copied from whatever books happened to be within reach, they penned sixteen poems, all of which were purposely devoid of meaning and cohesion. They then mailed the poems to Max Harris, editor of the literary magazine Angry Penguins, using the joint pseudonym Ern Malley. Accompanying the submission was a letter, supposedly written by Malley’s sister Ethel, saying that she discovered the poems shortly after her brother’s death and would like Harris to tell her if there is any literary merit in them. The result will leave you with your face in your palms. So I guess what I’m saying is that when I reread my favorite childhood book as an adult and felt basically the same way, I realized either that a) children have a remarkable capacity for processing loss, or b) none of us do. 8) In addition to this, I’ve been sketching and painting pretty non-stop in my spare time, rather than writing. I’ve been working on faces and feet/shoes, mostly, and just trying to develop a consistent, repeatable style. Next up: hands. I’ve also been updating a few pieces from my 30 Days of Painting series. There are several paintings that were almost good, but were rushed and needed some attention. 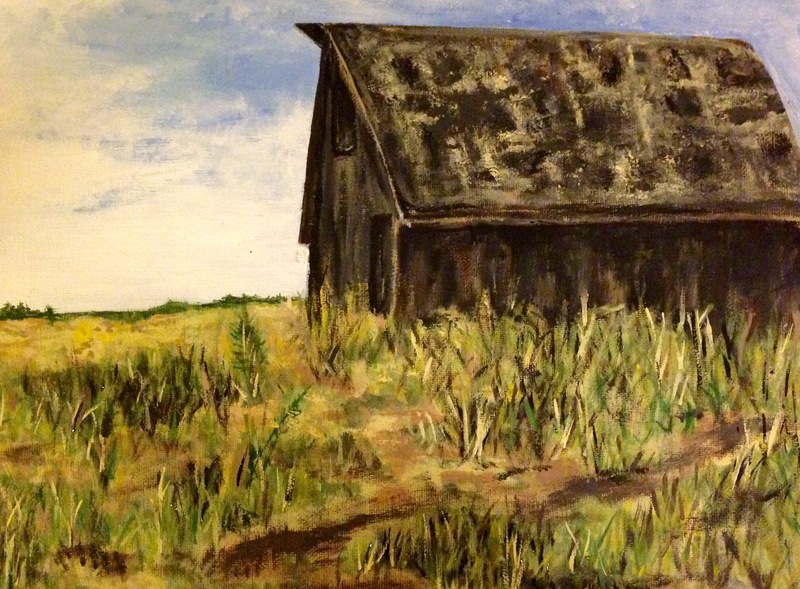 I’ve fixed up my acrylic barn panting, among others. That’s all I’ve got for now! Until next time. Wow, you have been busy. Thanks for the link, and good luck with painting faces – they’re the hardest! Thanks! I actually had some provisional success with faces recently, but only when painting/drawing from photos of actual children I know and have seen make a lot of different expressions. I’m not doing so well working from my imagination, though! The comparison between the Ring of Gyges and The Hobbit is really compelling. As an abstract concept, humans do seem easily corruptible. But when you examine specific individuals, things seem different. With Biblo (not human, granted, but that’s not really the point) I can’t imagine him using the Ring for anything other that helping his friends and occasionally for a practice joke. As always, you’ve given me a lot to think about. I think the difference between Plato’s vision and Tolkien’s is that Tolkien’s is inherently Christian. Plato is all about knowledge and a clear desire for what is best. In some ways, Bilbo’s lack of power is actually, for Tolkien, his virtue, rather than a deficiency the way it is for Plato! On the modern poetry post, wow. I feel better now about finding most poetry incomprehensible. And it looks like Alan Sokal is part of a long tradition. What a delightful collection of thoughts! I entirely agree with your anticipation of Malcolm Guite’s lecture. I am fascinated by the link between Tolkien’s Ring and The Ring of Gyges. I had always made the link with the Ring of the Nibelungs. Can there be some connection between these cultures? Finally, thank you so much for your barn. I ,love it!